Gaming on a budget is tough, because gamers use a lot of peer pressure on each other in order to keep their associated groups together. Your friend gets a new game and now you need to get it too, but the problem is that game costs more than you can afford. This creates a lot of conflicts and puts a lot of stress on something that should be a fun experience, especially as an adult. Luckily, gaming on a budget isn't a hard process and you can play some AAA titles for almost free. Follow these top five tips below and you should be able to game as much as you want without having to worry about money troubles bogging you down. Even MMOs, Guild Wars 2 is on sale right now until October! If Steam sells have taught you anything, the lowest price of a game is 25% of the original price. Games follow near the same model that mid-level designer luxury items do. Publishers know for a fact that people will pay full price on launch day for an item, but they also know as they lower the price, the amount of people who will buy the game increase. This is why the price slowly lowers, as it takes advantage of people who hold steadfast to a specific price that they can afford and it's why you should never buy a game at launch if you're trying to save money. To complete the previous analogy, there is a handbag / luxury good designer called Coach. Coach has two stores, "Coach" and "Coach Factory." They do not build these stores anywhere at all close to each other, because "Coach Factory" sells things for half the price or more than what "Coach," the full price outlet does. Why? Well, people with money will pay full price for the item. People who are less affluent still want the designer goods, but aren't paying sticker for them. Coach Factory opens up their brand to an entire new market of budget minded consumers who are willing to go an extra mile to purchase it. Those who can afford sticker or are too proud to buy the discount version will do so, no matter what. Those who won't, will not, but you can equally take money from both through this simple strategy. Video games operate on the same idea. Launch is when a game is going to sell for full retail, minus say a GreenManGaming discount that's running on all products or Wal-Mart / Amazon taking less of a profit to wrap the game into a bundle or just to get you into their store so you'll have to buy something else. As time moves on, and the money is gone from the desperate, they slowly lower the price. At each price point, people buy into the game, until it reaches its final price, usually 25% of the original. With that in mind, don't buy a game at launch. This applies just as well to MMOs, who after the first month are more than glad to discount their game and as a bonus, those friends who begged you to buy it may or may not still be playing and you might just get to skip out on the purchase all together. Some games never go on sale or have very few sales. 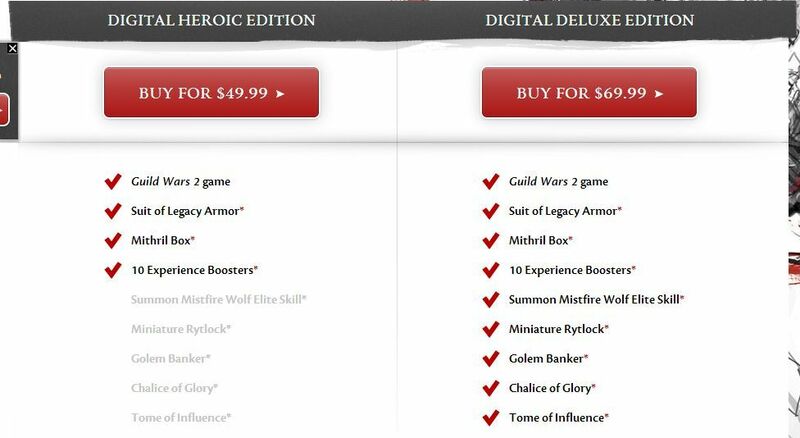 Guild Wars 2 and other non-subscription games usually keep high box prices for awhile. 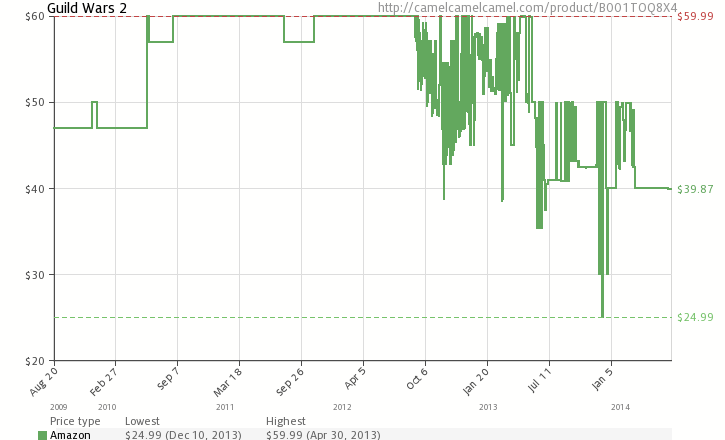 Chart courtsey of CamelCamelCamel. Discounts are numerous online. Between major gaming retailers who provide a constant flow of games and retailers who want to see their stock of digital codes, it's possible to get some really good deals on games. You just have to look. You can use sites like dealzon to find the cheapest game at most major retailers. Sometimes you have to have a coupon, sometimes it's a flat rate, and sometimes it's at places you'd never expect like Toys-R-Us. Discounts apply to a lot of weird things to, like xbox live / PS plus cards. Sometimes it's a coupon off everything, sometimes they're directly on-sale, or they're on eBay on a major retailers eBay store. I almost think that major retailers sell codes / cards on eBay for additional protections, I don't know it's weird, but again it's a great way to save money. You're going to read these articles and they talk at length about free-to-play this and how you can save a ton of money ditching the subscription. Sure. You can. You can also look for ways to play subscription games and save on the monthly subscription. For instance, WildStar has the CREDD system where you can earn in-game money to buy monthly game time. It's about I think 5 plat as of writing this, wouldn't take too terribly long to farm in the game at max level. A lot of foreign game developers implement systems where you can take surveys (I believe Perfect World does this for most of their games) to earn credit in their in-game shop. Of course, this is scam central, but there are a lot of resources on the Internet that help you wade through the offers and complete the ones that will actually gain you a net benefit, and a reduction of the monthly fees. Cash back incentives, credit card bonuses, and small task payment services are also options to help take the pain out of the 7 to 15 a month fee without depriving you of inexpensive entertainment. Additionally, game time cards are always for sell at a big discount on various websites, especially major retailers. Uniform discounts work sometimes for prepaid cards that are pre-activated (usually anything that you have to "load" money onto will never receive a discount). However… there is an exception. Reward points can usually be applied, sometimes. Like ShopYourWay rewards which gives flat cash back bonuses. There are also usually trades on various web forums. While sketchy and you can get easily scammed, there is often trades for one game card for another. This can work in your favor if you can pick up a specific game card on the cheap at a local retailer and trade it for the card you want. There are also buy a game and get a discount codes that are popular with Amazon and Newegg. Right now if you buy the PS4 version of one game for $40, you'll receive a $60 credit towards other games. Often on Amazon you'll buy a game and receive credit, which can then be applied for game cards on Amazon. Cool, huh? Anyway, there is a lot of ways to save on a monthly subscription. I myself just roll credit card rewards over to pay for it each month. Saves me a lot of stress. This is a tough one. So you want to download DLC but you don't want to pay full sticker, which can sometimes be $15 for a few new maps. The best thing for DLC is to wait until a Steam sale honestly. Steam sales almost always discount DLC along with the game and this often applies to MMOs that are on Steam as well. Beware DLC combos. Let's say a combo pack is $19.99 and contains 20 pieces of DLC, 5 costumes ($1 ea), 5 maps ($3 each), and 10 items (the single pack for all 10 is $4.99). Let's say that you specifically do not need the items or the costumes, then buying the maps for $15 or $7 on a 50% off sell is a much better deal. 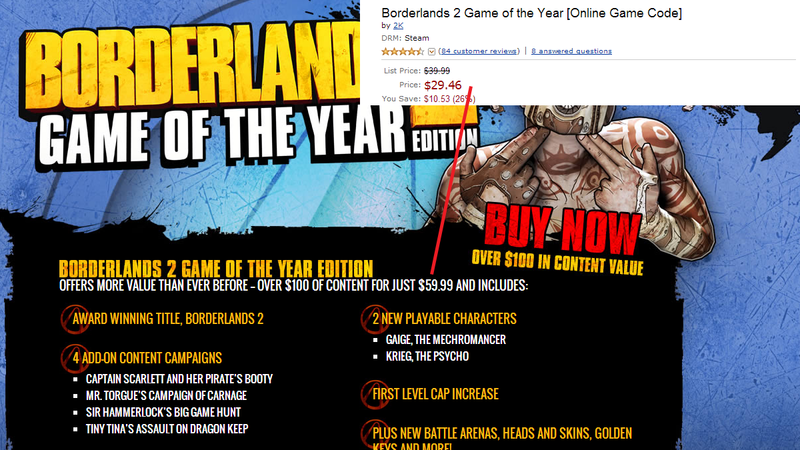 Then again, DLC is a losing proposition when it comes to Game of the Year editions of games. A GOTY edition will save you on average $20 to $100 in DLC costs, with a good median at around $50 for the price of the discounted standard game. MMOs don't do GOTY editions, at least I can't remember a recent one. Oh well. Outside of Steam sales, there isn't a lot here to work with. Some retailers discount DLCs and there are promotions, but more often than not they're fixed price for the life of the game. F2P games often offer a huge DLC / in-game item pack if you "purchase" the game. It's generally a one time thing, but it offers usually a substantial amount of return on investment. If you want to save money, don't buy either of these. Honestly. I love a lot of the game developers out there that make my favorite games and I fully support them, but the peer pressure to pay an extra $20 to $50 for an edition of the game is too much. For some games, it's a matter of necessity - for instance TESO, if you want a cheap horse early on this is the way to go. For others, it's all a bunch of items you will never ever use ever in a million years after the first five days. WildStar has some cool stuff, but at the same time, the Boom Boxes for playing the beta were more important / cool than the actual collector edition items since it has a chance to make you instantly rich vs. being someone with yet another of the collector hoverboards. I wouldn't call deluxe / collector's editions scams, although same games almost require you to purchase one to get through the start (by bundling in xp potions / mounts / early access to game features / etc.) and that's just not ethical. However, that aside, you can usually just muddle through anyway. Just remember that most collector / deluxe edition items will be forgotten about after launch and no one will care. The only exception is if the MMO REALLY takes off. Like… WoW takes off. However, most places sell digital versions now. There isn't that rarity anymore in the in-game items. So take that for you will. It's important to understand that even if money is tight, you don't have to deprive yourself of some of life's luxuries. There is a lot of ways to save money while gaming that don't involve people saying "get a job at McDonalds for 2 hours to pay for your subscription newb." Even if it isn't, it's usually a good idea to be smart about how you spend your money, considering there is a lot going into how games are priced and unless you're ready to deal with figuring out how and when and where they are cheap, you're going to have a bad time. Good luck and happy gaming y'all.